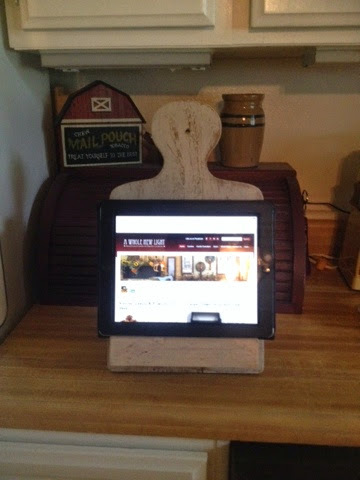 Here's a quick solution I needed to use my iPad while cooking. Now my iPad is not replacing my collection of cookbooks, but I do find myself using my iPad more when cooking. First, you'll need to find a wooden cutting board in a style you like. Don't worry so much about the condition 'cause you're going to paint it. Take your cutting board and attach your 1"x3" on the front with glue and screw from the back. Once dry, paint the front & back. I dry brushed and distressed mine. On the back of the board, attach your hinge. Cut another piece of 1"x 3" the length of you board. What you're trying to do is make it stand up. You may need to adjust it so that it stand up . Add you iPad and get cookin'!